This blog is about my writings, my views and reviews and my choices. Hello all, today I am up with another book review. Today, I am going to review a novella called 'When Our Worlds Collide' by one of my fellow bloggers, Aniesha Brahma. ‘When Our Worlds Collide’ is the latest novella by Aniesha Brahma, published as a kindle edition on 30th October, 2015. This 114-pages e-book contains the mixed emotions and self-discovery of a girl named Akriti and her crush Zayn. 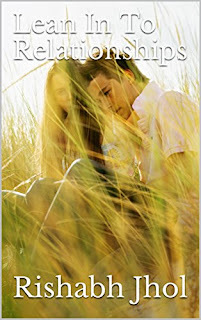 When I first got to read this e-book, I was pretty much expecting a usual teenage/youth love story but it was the preface of the book that totally made me re-think and refresh my expectations. The story revolves around the lives of a girl, Akriti who is at her mid-twenties and a boy named Zayn of the same age. The book starts with the flashback where Akriti, still a school girl, battling with the despair she faced when her parents decided to separate. Zayn, on the other end of the country combats his own misery of life that is to find his roots. The two get to meet coincidentally when Akriti goes to a new school. The story builds up itself at a later period, at present time, when Akriti supervises a small café that she inherits from her mother. One day, a major change in her life occurs when Zayn and his girlfriend Nimmi who happened to be Akriti’s classmate enters her café as well as her ever-so-secluded life. It is thoroughly engaging to read through the pages as every episode came with a new edge, progress and purpose for the story. All the characters in the story, namely Ayoub, Suzanna, Gia, Esha, Akriti’s parents, Nancy, Riley and Miranda give an added dimension to the story, defining the lives excellently. We get to see a lot of shades of the characters of Akriti- how she handles her father who decided to live with another woman leaving her and her mother earlier, how she manages to come out of her shell or if she can, how an introvert encounters the relations she always ran away from. As the plot evolves, we get to observe how it unfolds some truths associated with the lives of the protagonists. The novella is written in a very interesting rhythm. It started from a flash back then a couple of time-lapses and then to the present time. The story grew gradually very nicely that it had a strong impact for those who can relate to Akriti, or Zayn, or Ayoub or Akriti’s parents. With each page of the e-book I turned, it gave me a desire to reach for the end as soon as possible. The end was not of a usual teenage love story as I presumed, but it was as pleasing as I thought it would be. I must not give you spoilers! Written in a simple language, this novella has the potential to hit a lot of youthful hearts. The conversations used in the story are very crisp and does not seem monotonous. The characters Aniesha chose for her novella are very wisely given their traits, the characters does not get mixed up with one another. As a reader, you can remember every character for their own appearances, manners of speech and contributions. Overall, the e-book must be a delight to the readers as it is short, overwhelming and engaging. A copy of this e-book was provided to me by the author as a part of the blog tour by B00k R3vi3ws Tour. Views expressed in this review are my own nonetheless. Read it? Now drop a comment to make my day!